What a fabulous and inspiring resource for families! It’s amazing the simple little things that you don’t think about that can really make a difference. 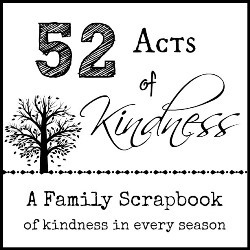 We can’t wait to continue filling out our copy of 52 Acts of Kindness Family Scrapbook over the year. It will be such a wonderful keepsake and memento of our year and will help teach my children important values along the way. As a parent I know that my actions and values have a huge impact on my child. This ebook brings together a collection of various acts of kindness that are simple and achievable for the everyday parent to do with their children. It’s motivating and inspiring. Thank you Chelsea. 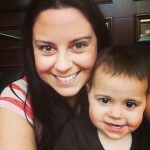 When I received 52 Acts of Kindness, I couldn’t wait to get started with my three girls. The acts of kindness are easy to follow, beautifully simple and there’s even a blank kindness for your family to create. This book is a meaningful reminder that it’s the little things that bring the kindest gifts of all. Are there holidays involved in the acts of kindness? No, there are only a couple seasonal ideas and most of the ideas can be done all year round. There are no holidays or religious topics mentioned. Do the acts of kindness have to be done in order? Nope. The pages have a place to add your own number, so you can go in any order you like through the 52 pages! The purpose of the title is to suggest that no matter what season you are in, you can always offer kindness. 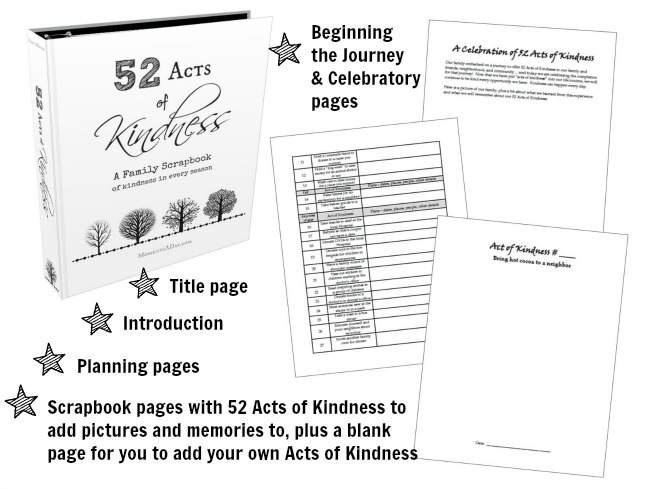 The idea of the scrapbook is that it can serve to help motivate families to intentionally offer acts of kindness to their extended family, friends, neighborhood and community throughout the entire year. What can I put on each page? While most families keep pictures online in this digital age, this book offers a nice reason to add family photos into an album which includes wonderful memories together. Or, if you prefer, you can draw pictures of your experiences and use it as a journal for your child. You can also ask your child what part they enjoyed most or what their favorite memory was, and write it on the page. How can I put the book together? You may like to punch holes into the pages and use rings or string to keep the pages together, or slip the pages into plastic sleeves to keep in a three ring binder. You could also paste the pages up on a Wall of Kindness or a Kindness corner (see one we made here). Be as creative as you wish! What age of child is this for? The Acts of Kindness listed in the book are suitable for young children, but can be fun and meaningful for older children as well. To see a complete list of the acts, visit this post. I would love to share what we are doing! If you share pictures on social media about your acts, feel free to use the hashtag #52actsofkindness so we can all participate in the journey together. I’m just not sure if we can do an 52 Acts of Kindness next year! You can enjoy your Acts of Kindness as a Saturday tradition, Wednesday after school, or any other time your family enjoys spending time together. 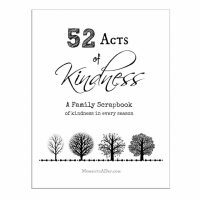 Whether it’s once a week, more often, or just at random, this book can give you practical ideas and an organized space to track some of the “kindness” your family offers to others. Once you get into it and start to enjoy serving others, you will probably want to do more than 52! 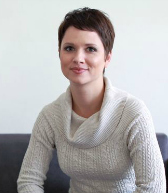 Chelsea Lee Smith is the founder of MomentsADay.com, a website dedicated to sharing activities, ideas, and resources for families to connect, build character, and make a difference. She believes in using small moments throughout the day to help children learn how to use their head, heart, and hands to make the world a better place. 52 Acts of Kindness was born out of Chelsea’s challenge to herself to spend a few moments every day helping her children build character. In the process, she has been amazed how positively the activities have affected herself and the entire family unit. 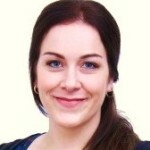 Want to blog about your Act of Kindness? If you post about an act of kindness, you are welcome to add this badge to your post. Thanks for sharing the love!